We are heading back out on the road in September with tour dates in Ontario and Alberta. For the Ontario dates, we will be joined by Blackie and The Rodeo Kings drummer – Gary Craig, who played on most of the tracks for Tea and Confidences. In Alberta we are joined by the outstanding drummer Kent Macrae. It’s exciting to hear these tracks come alive as a trio and really fun to watch Andy simultaneously play bass pedals with his feet, whilst singing and playing guitar. Stephen gets to stretch out on various electric guitars and sing his heart out…. it suits him. There are still a few dates to be announced, but here is what we’ve got so far. Tour dates are of course on the TOUR page if you prefer. Anybody out there taking pictures of the band and using Instagram can add #fearingandwhite and those pictures will be posted on this website in the Instagram section of the Photos page. Hope you can make it out to some of the shows. Stephen and Andy have just spent a week mixing the second Fearing & White album in LA. 11 cracking new tunes. And, no, they weren’t wearing their winter gear. The dynamic duo played earlier this year at Folk Alliance in Toronto, and on July 11 they’re making a surprise appearance at a Flood Benefit show in Calgary, a city dear to their hearts and where the first album idea was hatched. 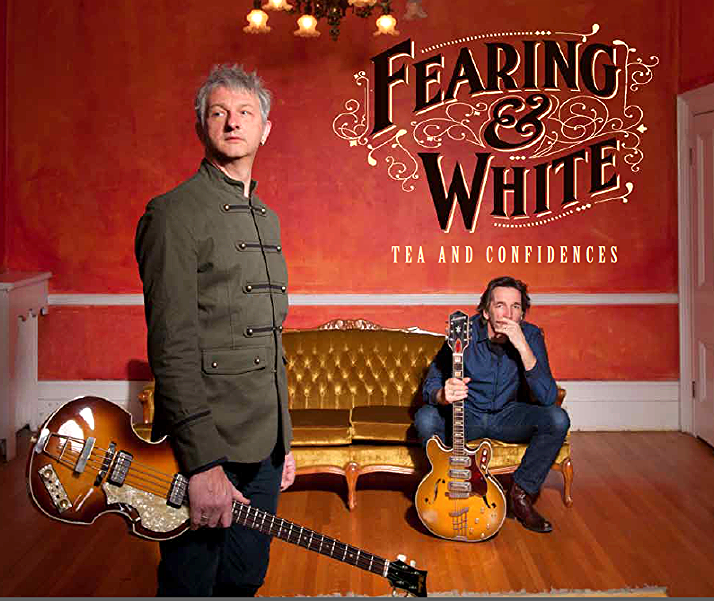 So this is to say hi … it’s happening … Fearing & White will be very busy in 2014 … stay tuned! Fearing & White are confirmed to play Vancouver Folk Festival, the Artspring concert series on Salt Spring Island, and the Islands Folk Festival on Vancouver Island, this coming July. Have a look at our tour page for dates and details.